This weekend was truly a full-circle moment for TEDxWomen. We started our journey in Washington, DC in 2010 in a partnership between The Paley Center for Media and the extraordinary TED conference team. One of the most exciting features that emerged at that first TEDWomen was the response of the TEDx community, the hundreds of independent organizers who convene local TEDx’s elected to convene TEDxWomen conferences all over the world, participating in TEDWomen via live stream in every time zone. This global response convinced us to convene in 2011 as a TEDxWomen and curate a one-day conference at the Paley Centers in NY and LA, working closely with TEDx program director Lara Stein and the TEDx community to offer our remarkable roster of speakers to the global community of TEDxers. The innovation that year was to make it bicoastal with TEDTalks and audiences in the Paley Center theaters and once again to thousands of women and men participating in TEDx conferences all over the world. On Friday, November 30, we convened TEDxWomen 2012, back in DC, partnering with the United States Institute of Peace in their breathtakingly beautiful new home on Constitution Avenue. Across from us, the lights were coming on at the Lincoln Memorial, and a few blocks away, the holiday lights were going up at the White House. It was a really amazing setting to spark things off. Around the world, TEDx organizers convened TEDxWomen conferences, joining us via live stream. In fact, more than 150 locations in 53 countries—from Accra to Amsterdam, Madagascar to Malaysia, Saudi Arabia and Iraq—tuned in. Circumstances may be challenging in some of these places, but that didn't stop nearly 15,000 people from convening with TEDx organizers to hear our speakers and thought leaders, idea shapers and change makers, some from their own communities. 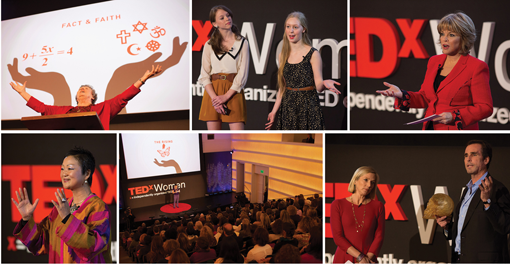 At TEDxCrestmoorParkWomen, in Denver, Colorado, an 11-year-old cohosted an event for girls and women of all ages. In Saudi Arabia, the courageous president of a women’s college once again found a secure way for her students to hear the full range of subjects and ideas to be explored on the stage. At TEDxNelspruitWomen, Shan and Bronwyn Varty convened in a new digital learning center in South Africa’s Kruger National Park. Like most journeys in this complex, globalized time, this annual gathering has not been linear or limited by geography, or even by expectations that a women’s conference is only for women. After tracing some of the most powerful threads that have been woven throughout these past two years, and speaking with organizers from all over the world at this year’s TEDxSummit in Doha last spring, we landed on this year’s theme: The Space Between. We live in a time of extremes. The public dialogue often frames our most profound discussions in the inherently limited vocabulary of polarities: the rich vs. the poor, men vs. women, right vs. left, work vs. family, peace vs. war. In fact, we know—women especially know—that this black-and-white worldview is fundamentally flawed. The world is not made up of polarities, but of spectrums. It is not structured like a line, but a web. Everything from the shape of our DNA to the Internet bears this out. On Friday and Saturday, we rejected the reductive rhetoric of either/or and, instead, embraced the complexity of both/and. We examined, in the space between, the challenges we face and the opportunities we have. We honored the unique power of women to see the thousand, subtle shades of gray in between black and white and to act at the intersections of so many critical issues. The Space Between is where ideas worth sharing are truly born. As TEDxWomen 2012 came to an end, the amazing Eve Ensler—playwright and activist founder of VDAY, a movement to end violence against women and girls—took the stage for The Rising, a session she curated and hosted. The audience in DC rose to their feet to join the hundreds of others who had been viewing in the comfortable simulcast spaces around the USIP building to hear seven exceptionally talented young women perform an original anthem, “Break the Chain,” written by world-class composer and music producer, Tena Clark. EVERYONE joined them in the dance. I saw 22-year-old Shabana Basij-Rasikh from Afghanistan, who started her own school for girls in Kabul, talking with iO Tillett Wright, activist/photographer. Korean spiritual leader Hyun Kyung Chung deep in conversation with National Geographic explorer Elizabeth Lindsey about wayfinding. Philanthropist Jacki Zehner connecting with South Africa’s Malehlohonolo Moleko, who traveled for the first time outside her rural village to share her story of entrepreneurship and personal rise out of poverty. Sister Joan Chittister was dancing (yes, dancing) with Eve Ensler. Spirits were rising from new connections and hearts were inspired by personal stories of triumph and minds were stimulated with all the incredible new ideas that had been shared by women and men from more than two dozen countries, connected to thousands convened in more than 50 countries and scores of US cities to hear their own TED talks and to be with TEDxWomen via the internet. If you missed this awe-inspiring day, join the conversation on TEDxWomen.org and on Twitter #TEDxWomen. We welcome you all to share ideas worth spreading.